Can I accept the CSA approval mark if my spec requires the UL certification? Independent testing laboratories, such as the Canadian Standards Association (CSA) and Underwriters Laboratories (UL), serve as a third party to validate and ensure that a product is safe for use. For many years, UL was regarded as the foremost certification laboratory in the United States. Yet, within the past 20 years, acceptance of CSA in the United States has grown to where the UL and CSA/US marks have become virtually interchangeable. Isn’t the CSA mark only for Canadian Products? No. Although CSA is often perceived as a standards authority for Canada, the laboratory offers global services with offices in the U.S. and Europe. In fact, in 1999 CSA changed the name of its certification division to CSA International to reflect this. So can CSA approved products be used in the United States? Yes. In 1992, CSA became accredited by the Occupational Health & Safety Administration (OSHA) as a Nationally Recognized Testing Laboratory (NRTL) to test and certify that a product meets US standards. Be sure to confirm that your CSA approval mark is the CSA/US mark and not just the standard CSA mark. The standard CSA mark means that the product has only been approved by Canadian standards. The CSA/US mark, the mark on all of our CSA approved products, represents that the product is approved for use in both the U.S. and Canada. How are the CSA /US and UL marks interchangeable? All NRTLs use the same testing standards regardless of which lab performed the tests. Furthermore, CSA and UL have worked together to streamline the certification process. One example includes UL accepting CSA approved electrical components for end product testing to avoid redundant testing. 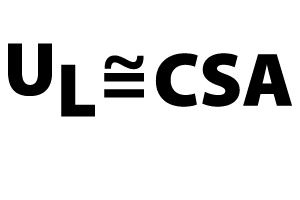 Another is that CSA and UL reached an agreement to offer dual certification where a product is able to get both a UL and CSA approval from just one of the two laboratories. Through efforts like these, CSA has become widely trusted by leading US manufacturers which include GE, IBM, Black & Decker, Apple, and HP. What is the advantage for accepting the CSA/US mark? In addition to accepting the UL mark, also accepting the CSA/US mark has its advantages. A policy that requires a certification from a single laboratory needlessly limits the product selection and takes focus away from price, brand, and quality. On the other hand, requiring that a product is certified by any OSHA NRTL maintains a wide selection of products while ensuring safety conformance. If you have any questions about UL or CSA approvals, please let us know and we will be glad to help.